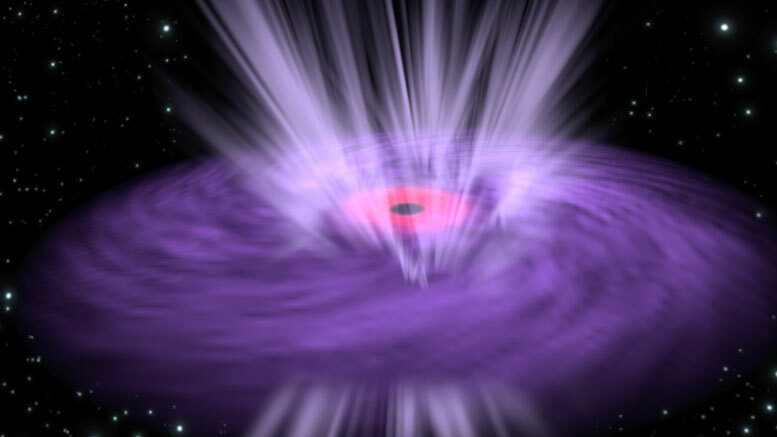 This artist’s concept illustrates a supermassive black hole with X-ray emission emanating from its inner region (pink) and ultrafast winds (light purple lines) streaming from the surrounding disk. A team of scientists has measured rapidly varying temperatures in hot gas emanating from around a black hole for the first time. These ultrafast “winds” are created by disks of matter surrounding black holes. Supermassive black holes can be voracious, devouring gas, dust, and other material pulled in by their gravity. These feeding frenzies can get messy: the disks of matter surrounding black holes can fling out ultrafast streams of hot gas, or “winds,” that blast through their host galaxies. These winds, according to new measurements of a nearby supermassive black hole obtained with NASA’s Nuclear Spectroscopic Telescope Array (NuSTAR) telescope, can heat up and cool down in the span of just a few hours. The findings, made with NuSTAR and the European Space Agency’s XMM-Newton telescope, appear in a paper in the March 2 issue of Nature. Supermassive black holes are orbited by disks of gas and dust, called accretion disks, from which they feed. Young and energetic black holes, such as the nearby one studied by NuSTAR, can only feed so quickly, however, before their accretion disks begin to emit streams of fast, hot gas in all directions. These winds, which travel at a quarter of the speed of light and carry an enormous amount of matter, can disrupt star formation in the black hole’s host galaxy. To measure the temperatures of these winds, the team studied X-rays coming from the edge of the black hole. As they travel toward Earth, these X-rays pass through the winds, and some wavelengths of the X-ray spectrum are absorbed by different elements in the winds, such as iron and magnesium. By examining the holes, or “absorption features,” in the X-ray spectrum as it reaches Earth, astronomers can learn more about the components of the wind. While observing this spectrum, the team noticed that the absorption features were disappearing and reappearing in the span of a few hours. The team concluded that the X-rays were actually heating up the winds to very high temperatures—millions of degrees Fahrenheit—such that they became incapable of absorbing any more X-rays. The winds then cool off, and the absorption features return, starting the cycle over again. The paper is titled “The response of relativistic outflowing gas to the inner accretion disk of a black hole.” Other Caltech co-authors include postdoctoral scholar Javier Garcia. The work was funded by the European Research Council, the European Union Seventh Framework Programme, the Science and Technology Facilities Council of the United Kingdom, the European Space Agency, and NASA. Be the first to comment on "Scientists Measure Temperature Swings of Black Hole Winds for the First Time"